Comforting your little ones during bedtime isn’t easy. Letting them cry it out is miserable for everyone, but rocking them for hours until they fall asleep in your arms is exhausting. 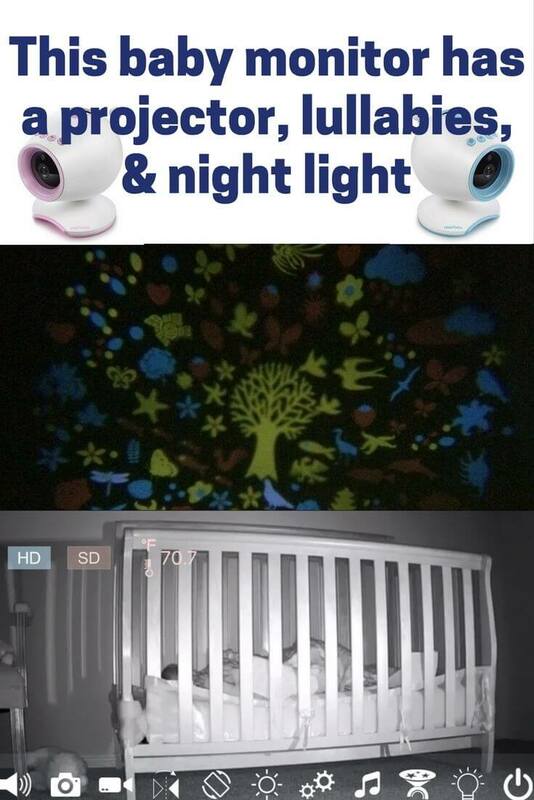 Luckily, you can comfort your child from a distance using the Hola Baby monitor. No baby monitor has it all, which is why many parents revert to basic WiFi cameras like the Nest instead of using one dedicated to comforting the baby. We just tested the newly released Hola Baby WiFi baby monitor, which has features that my toddler loves. It’s changed our bedtime routine for the better. We wrote up a full Hola Baby monitor review with pros and cons to help you decide if it’s right for your home. Affiliate Disclosure: This page contains affiliate links, which earn us commission at no cost to you. Disclaimer: The writers of this blog received free samples of the products for review. They were not compensated in any other way. The opinions are 100% their own and not influenced. Camera: First impression, it felt a little large, but looked fun and friendly so it wouldn’t scare my timid toddler. It comes in pink and blue, but I’d love to see a more gender-neutral color like yellow, which could match any kid’s playroom. The included instructions were helpful and set up was straightforward. Simply download the app, plug in the camera, and type in or scan the information on the bottom of the camera. Then connect it to your WiFi and login to the camera. I didn’t run into any snags, but the login page froze for a second. When I clicked back and tried adding the camera again, it said I had already added it. I refreshed and it was there. Important note! The cameras come with a standard username and password that is very hackable: the username is admin and the password is 12345. Before doing anything, make sure you reset the username and password with something personalized and more secure. These types of security cameras get hacked all the time because the users don’t reset the credentials. Unless you are begging to get hacked, do this immediately. It would be much more difficult to hack the camera after it has a strong username and password and is on a network that also has a unique, strong password. 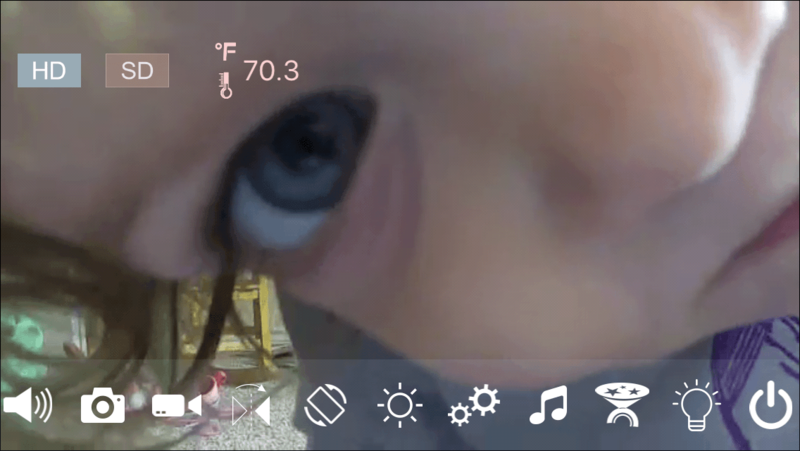 However, the Hola Baby camera is definitely missing some of the security measures of other cameras. It appears to be made in China, and doesn’t say anything about SSL or https protection. If you consider this a big con, look into the Arlo Baby, Nest, or other baby monitors. 720p HD video. Looks very crisp and gives excellent footage for keeping an eye on the baby. The video feed loads quickly whenever I launch the app. Full 1080p really isn’t necessary for this purpose. Super bright night vision. This is brighter than other security cameras with night vision that I have tested before. 10 different lullabies. Unfortunately you can’t have them loop, but hopefully this feature will get added in the future. Projector on top displays colorful shapes on the ceiling. My daughter loved this, and I can see why. It looks bright and happy, and is very soothing for bedtime. It’s hard to really do it justice with a picture, but here’s what the design looks like. 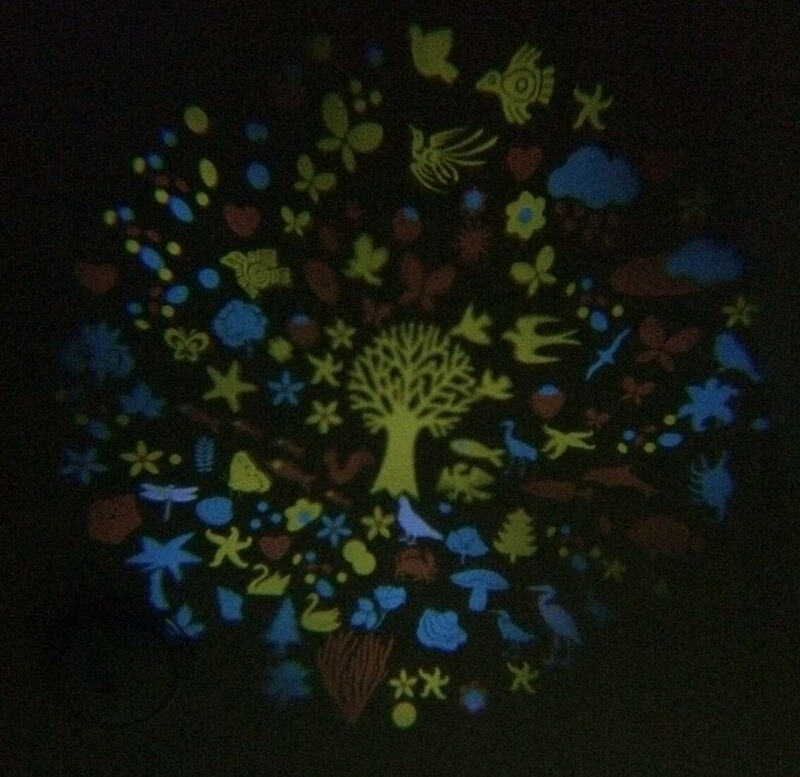 Night light in the base of the camera is multi-color. Select a color or have it rotate through the different color options. Thermometer to measure room temperature. The temperature seems accurate compared with the rest of my house. This feature is much-needed in our routine. There have been a few times I went to check on my little one and it was chilly or very hot in her room. It’s nice to keep tabs on the temperature and get alerted if it’s at uncomfortable levels. 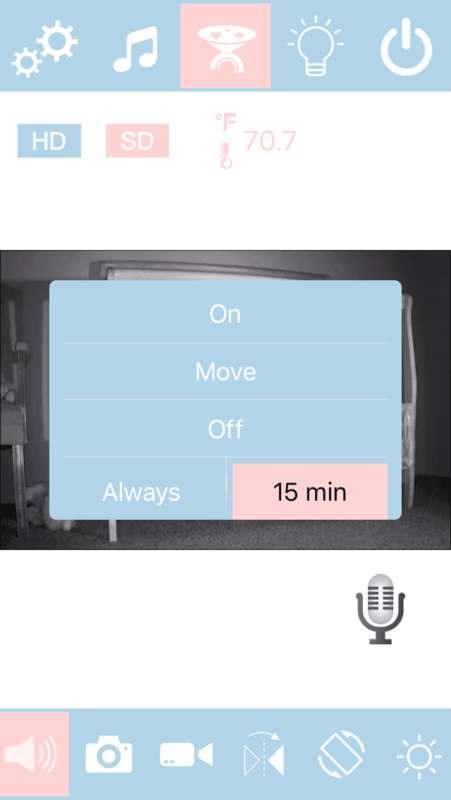 Two-way talk using microphone and speaker. The audio worked well and sounded clear. It includes echo cancellation, which may have helped it sound great. 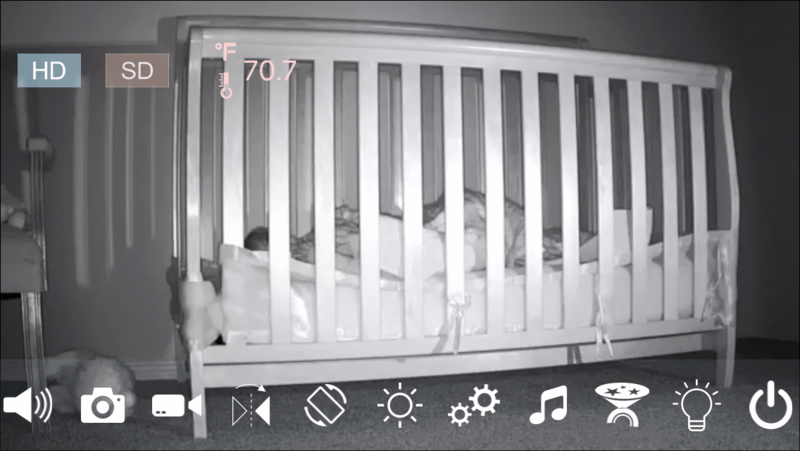 This feature is awesome: I can just say “go to sleep” and my daughter looks around and lays down without any more argument. Buttons. The camera has buttons on the top for changing the volume or starting the music. My little girl loves these little buttons, as you can see below. 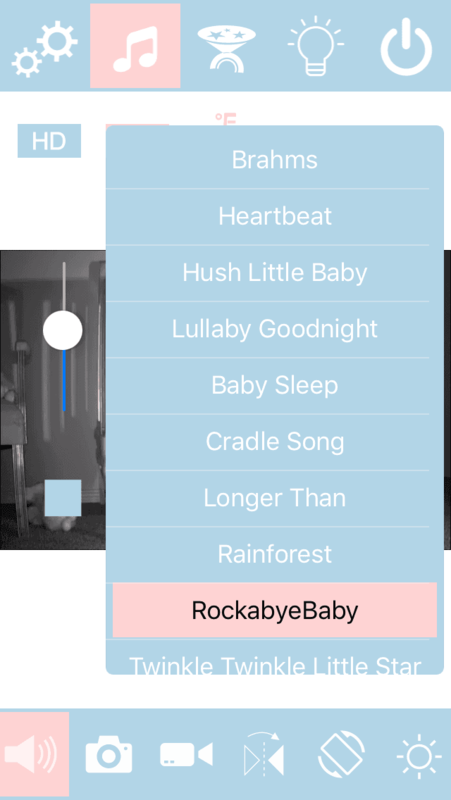 I also appreciate that you can quickly start the bedtime music without fiddling with the app. Record or take snapshots. These are housed on Hola Baby’s servers, without any charge for cloud storage. I don’t see an option for downloading the videos. Toggle HD/SD to change video quality. Mirror, flip image, or change brightness. alarms for movement, audio, and temperature. 3 sensitivities allow you to adjust the sensitivity to reduce false alarms. Turn off projector after 15 minutes or keep it always on. You can also select the Move feature, which slowly makes the image disappear. Create unlimited user accounts. This is listed on the Amazon listing, but I’m not sure how to create more user accounts in the app. The Holababy app (one word in the app stores, FYI) works well, but sometimes it feels like it’s in beta mode and improvements could be made. The design looks a little basic. Most features work fine, but one day the notifications broke on me. It started notifying me every 5 seconds, even when I desperately turned off the notifications in settings. I finally had to manually unplug it and plug it back in, but if I wasn’t home, it would have been very annoying. Hopefully this and the smaller issues will get worked out over time; if so, we will update our Hola Baby monitor review. That’s our Hola Baby monitor review. Overall, Hola Baby has the bones needed to be a great baby monitor. Its features are specifically designed to make life with a baby easier, and it accomplishes just that. The night light, projector, lullabies, and two-way talk are all game-changers for parents struggling to put their kid to sleep. I just ask my toddler if she wants to look at the lights and listen to Twinkle Twinkle, Little Star and she runs into her room for nap time. The software has its issues, but this is normal for new smart home products. None of the bugs made the baby monitor unusable. I probably won’t use notifications until the next update comes out, but I can easily hear my little one crying, so it’s not a deal breaker. If you’re looking to compare other baby monitors that have been out for awhile, check out our article Arlo Baby vs YI Dome vs iBaby vs Motorola. No new app is perfect, but Hola Baby is very easy to set up and use. It’s super kid-friendly and will greatly improve your bedtime routine. Just make sure you change the username and password during set up. 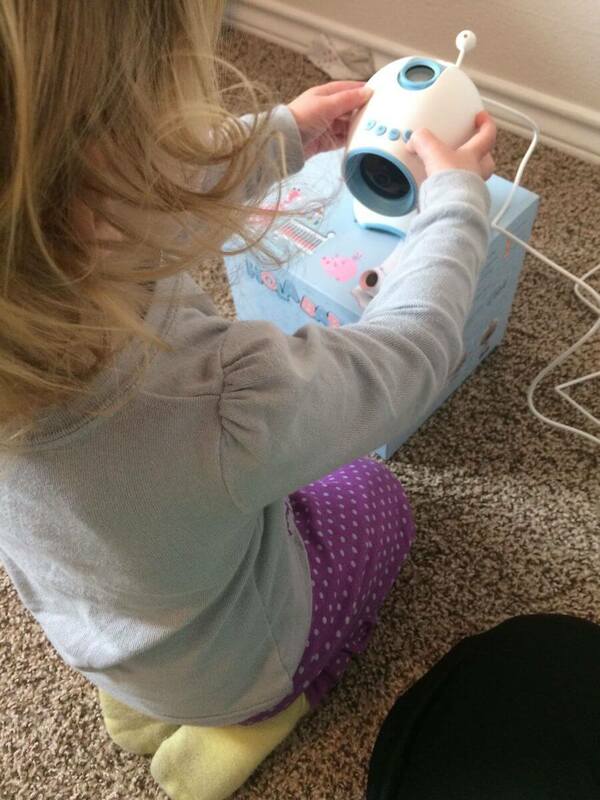 What do you think about our Hola Baby monitor review? Let us know your favorite baby monitor in the comments!